Boy I love eggs. For those of you who know me well you know I eat up to one dozen a day. Yep, that’s pretty easy for me to do. Of course only two of those eggs get to keep their yolk – the rest are egg whites. I most typically scramble them at a 1 whole egg: 5 egg white ratio. That is only 145 calories for my ½ dozen serving and 28 grams of uber quality protein. Why do I eat so many eggs? They are versatile cooking-wise, all natural, low calorie, packed with vitamins and minerals and have the highest protein efficiency ratio (PER) of any food on the planet. And even better they cost an average of just 16 cents an egg. I am also a big advocate of a mixed diet for most people. That means the diet should be 1/3 lean proteins, 1/3 healthy fats, and 1/3 unrefined grains, legumes, fruits and vegetables (carbohydrates). Eggs are one of my easiest and best staples for the protein portion of that diet type. They also have a strong filling capacity – i.e. an egg with a few whites will go a long way for making you full compared to equal calories worth of carbohydrate foods or fats – This is essential for fat loss and staying lean. Let’s review more benefits of eggs, crack the cholesterol myth and show you some of my favorite easy-to-make egg recipes. One of the big concerns with eggs is their cholesterol content. Although most current research links increased cholesterol and the potential for heart disease to dietary saturated fat when compared to dietary cholesterol – it is still important to be aware of. Like I said earlier I recommend doing scrambles with 1 whole egg : 3 or more egg whites (which have no cholesterol). You can go with a single egg too, but you will be only getting 7 grams of protein. 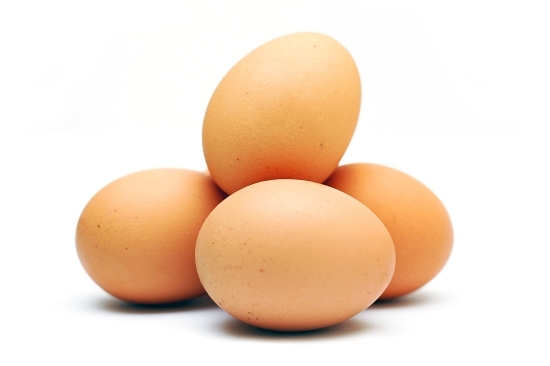 Mixing the whole egg with more whites increases the protein while maintaining the rich flavor that eggs offer. One thing that is perplexing to me is why eggs culturally are considered a breakfast food in America. I have traveled to Japan and found that it was a part of many lunch and dinner options. And I have been told that in Australia it is a major addition to many things as well. Since I am such a radical, I often have eggs for breakfast, lunch and dinner. My following three favorite recipes are quick and easy to make, low in calories and sugar and packed with protein and fiber. Add olive oil and peas and carrots first (1 min), add leftover brown rice second (2 min), finally add egg mix. Great post Derek...Thanks. Love those eggs!